So on a personal note...we lost. The GB Masters fought hard to come back from 5-8 down to make it 9-8. We felt good for the win and inspired even more so by the women's team giving us a quality breast wave complete with Union Jack nipplies after each point. All that said, GB and the USA were very evenly matched and as the game swung back and forth, the timing favoured them as it ended in the cap with them taking it 11-9. Tragic in one sense but triumphant in another as we know we did very well against them and they were a great bunch of guys to lose to. USA did sympathise as they lost in the final in 2004 to Austria after a tough one. Perhaps that means it's ours in 2011. The GB Women...what can I say about them. They were top class performers on pitch and off. I made a lot of new friends on this trip, many of which were on this team and I was extremely proud to be playing GB as they took took revenge for our loss by winning by 3 over the US team. Going into the final each team had a win against each other but I believe this time the better team won. GB had it all together and had the spirit going for them as well. The medal award itself was really well done. I'll get a picture of it online in my flickr area in a moment. The women's gold version was a gold medal on a green string (very Brasil). Something cool enough that you could wear out and not just put on a trophy shelf. 1. lost the final to USA by 10:30. 4. Had to rush to Bus Station to get tickets back to Pipa that night because there was only 4 left. It's a miracle this happened at all but thanks goes to Anna Shipman for alerting me to the urgency of the situation. 6. More beer...swimming in the sea...a nap and almost missed my bus to Pipa. No internet in Pipa, sorry. I did try to write an entry back at the hotel but you really should see it. Perhaps I should post it because it really is a pile of drunken jibberish. Well done to all teams at WCBU and all players who stepped up to represent their country. There's part of me that want's WCBU to take on the same level as WUGC but at the same time, I hope that each countries top grass players still concentrate on there not so sandy area of expertise so that that Beach World Championship stays the big competitive chill-out party that it is. Thanks Brasil and thanks to Patrick for another success. Well it sounds like it's been an awesome tournament at the World Beach Ultimate Championships in Brazil. I've just got off the phone with Steve, who's chillaxing after a hard week in the soft Brazilian sand. Unfortunately he's in a place with no internet connection. So here's the results as far as we know them. GB Women Gold - Yep that's right GOLD as in "always believe in your soul, you've got the power to ... etc.". They defeated the USA in the final. Come on ladies - Awesome work. GB Masters Silver - as in Hi HO Lining. They lost in the cap to the USA, in a very hard fought game. GB Open 4th - as in May the 4th be with you. Post any other information in the comments, also if you have an congratulations for the teams, then comment me up. It was a massive day for GB all around. GB Women clinched an appearance in the final finishing at the top of their group and avoiding a 2-3 semi final late today. The semi was between the Aussies and USA. I didn't see much of it however I do know that the US team was too much for Aussies and will be facing GB Women tomorrow. They have already played twice with each taking a victory. As you can imagine it's early to bed tonight for the ladies. GB Masters pulled some energy out of their arses to defeat Portugal today to put them 3rd in the group and subsequently defeat...I say defeat...whup is when I mean, the Canadian Masters 7-2 in the 2v3 semi final to put them into the Masters final tomorrow against USA in the second USA - GB final. The play in the Canada - GB semi was incredible. One point lasted 25 minutes with as many turnovers from each side and some massive play from both teams. I was on for that point. We all chalked up some killer D stats and showed that we had the legs to last and gave the US team watching a real scare. Last time when GB faced the US team it was a sudden death defeat for GB. It'll be different tomorrow (I hope). GB Mixed have done very well at the event. Had they been able to gel and work on their consistency a bit more I think they could have contended quite a bit more. That said they finished today in 7th position in the Mixed division narrowly loosing a series of matches, each by only a few points. The position does not reflect the level of play from this team and respect must be given for their hard work. They were at a point only a few points away from the final in the game against Austria. GB Open. This is a rather tragic tale. These guys have worked their asses off to be here and have shown by defeating the Aussies early in the tournament that they have got the balls and the heart to take it all the way. The tragic bit was loosing captain Dave Pichler today to illness leaving them without him for their semi rematch against the Australians and possibly contributing to their loss to them this time around. They played a hard fought match against the USA Open team but in the end the leaderless squad with stunning performances from Sicko and Caesar were still not enough. GB Open, 4th. I first caught the Philippines playing against...I can't even remember who now. It was insane. Basically a bunch of hyper buff 5'5 average height guys and one girl (lets be clear about that because she's as part of the team as anyone) are storming through the top teams at this event! They play a fast paced, unhindered by conventional tactics style of play that is tearing the place apart and building a huge fan following at the same time. Their latest results being a win over the GB Open team who, while looking quite good, could not handle the speed of the Phillipines squad on turn-overs, and a win over the USA team in the semis putting them into what is sure to be a killer final against the Aussies tomorrow. They seem to have a 'plinko' style of play, for those who have watched the A&B videos 127 times like I have that involve passing and running like a bullet into position. I did think of stories I'd heard about the Buzz Bullets in Perth and they're unconventional style. Perhaps the far east have developed the game to a new level having reverse engineered the western tactics. Typical but consistent and effective here. Everyone is really excited to see more from them. I think it's a good time to mention that the GB Masters played them this morning and put up a 11-7 scoreline against them. Ok maybe they weren't pulling out all of the stops but it made us feel good. The team made a request to mention their tournament next March. Look it up online and go, they'll be happy to help you with accommodations and flights as well. I thought in line with Felix and Ultivillage's COTD (clip of the day) I'd put together a point of the day for you. It's GB Women v USA Women. To give you an idea of the tight game and the effort required to score each point I've chosen one point I thought was exceptional to video blog. Enjoy. After complaining a bit about the Hawaiian party we still put the effort into going to the Disco Party. This required a taxi to take us to a remote(ish) club only to find out the door man was charging R20$ to get in. This wasn't part of the plan so a small protest gathered outside and proved to be one of the highlights of the event as the players indulged into trying a bit of Capoeira (http://en.wikipedia.org/wiki/Capoeira) with the Brasil team and ended in a party that could not be stopped. I'm proud to have been part of the 8 strong GB team who represented there. It seems there is a giant white board with results on it right next to the burger bar area attached to the arena pitch fence. It's just me who is a 'tad disappointing'. I'm recognising my mistakes and moving on. I was correct last night and found that the scores are in fact on the bula blog (http://www.beachultimate.org/blog/) in details and the current state is coped below. The boring news first. GB Women have stomped just about everyone. The real competition appears to still be coming from the USA and from the Aussies however having beat all of the competition thus far they are feeling rather confident. We'll see how confident tonight at the Disco party. The Masters basically had a poor day. They lost a tough one to the USA team 11-10 in sudden death (or maybe it was 10-9). After some hard D and a some solid but missed layout D attempts the US team snuck the final point home. Great spirit has dominated the Masters division and although the loss was tough it was a great match. The game today against Canada showed the Masters feeling a bit weathered...literally. It was 35deg in the shade and sunny today. Perhaps a bit of over exposure or maybe even sweaty hands were part of the equation but Canada took over the game just past half to win 11-6 (or close to that). Jamie Rogers was the exception sending some clinical long discs to Wayne Davey. The rest of the team however put disc to sand, unforced too many times to hope for a victory. The encouraging end to take from this was that the GB Masters can play and will play much better. Brazil and Portugal are on the cards tomorrow. This is it if there is to be a chance for the final. Highs and lows are what the Mixed team are all about. They played magnificiently against the Swiss Mixed team today with an impressive 8-5 win from behind. Somebody comment on this if I've got that part really wrong. At times they look like a team destined for the final, and others, well my mother used to say if you don't have anything nice to say, don't say anything at all. I watched their game against the German Mixed team who are tipped again for the final to repeat their Gold performance in 2004. This team is basically the team that played at EUC this summer. They performed well there and are showing here that they are World Class. A game to watch will be USA/Germany. (Photo: Gary Lloyd bids against a strong German Squad against a beautiful backdrop of Maceio). I missed out on them yesterday for which I apologise. I don't have any contacts on that team to keep me informed however I can say that they do look good at times. Yesterday their game against GB was hot! They lost it but it was a killer performance and left me impressed with the thought that they would end this event with a respectable placing. Same as above...they looked outstanding today playing against the USA mixed team. I don't know the result. I'll make some effort tomorrow to give some results on them. what I'm finding a tad disappointing is that it's difficult to get results. In Portugal there was a large white board out with daily results on it. Here there isn't any recognisable headquarters to so much as ask a question about the event. Scores are submitted to the scorekeepers who disappear somewhere and the blog or event website doesn't seem to have anything current on it. Last night was the first party of the event and was a Hawaiian theme. That said, the bar staff could not keep up, the Hawaiian theme was simply a prearranged idea with little effort at the party itself to accent this choice so it was effectively a bunch of people dressed funny in a bar. Tonight is the 'Disco' party. I don't imagine it'll be more than a DJ playing disco music. Even so, I think I'll be pretty happy with that. Won all games beating the US and Canadian Masters by quite a bit. They struggled against the GB Masters however but luck was on their side as the snuck out a cheeky victory only winning 16-4. The boys will start facing tougher opponents in USA, Australia and Canada later in the week. This is the big news! GB defeated USA Women, turning the tide from being initially down 4-5 to score 5 points consecutively to win 9-5. They also played the Currier Island Women and won it easily 18-0. The women's game on Currier Island is only just taking off with this being the first ever representation. Defeated the Peace Team featuring the lovely Alia and a slew of mega players as they found their feet as a team. I think the peace team will improve as the tournament progresses and will start upsetting some of the heavier teams in Mixed. Just as an aside, the Mixed division is the most popular here. As coming to Brazil was a considerable expense for most people, some countries put their money players into the Mixed first before considering other divisions. This has made mixed games very entertaining and competitive to watch and I'm sure play. Other games featuring the Mixed squad was a match against the near robotic USA Mixed team. I filmed some of this and in the end decided it was a giant lowlight reel. GB just packed up and went home for this game. I was disappointing to watch, know they had so much more to offer and likely disappointing to play for them as well. I think the US won 16-3 or so. Lastly the final game of the day was GB Mixed v Scotland Mixed. This was a cracker to watch. The first half was anybodies games with Scotland pulling out the bling and take it down against a tight GB D. The final score was 15-8 for GB Mixed however we saw the Scotland were a team to be reckoned with. Message from Anna Shipman on GB Mixed while I was filming 'Hi Mom'. Video highlight from this match will come in a later blog. The Masters division is non-stop lesson in how to play ultimate. With supple throws, little movement and a sublime grasp of space, the Masters are the shizzle. Unfortunately the GB Masters played only open teams today and shizzle can only take you so far. The Masters lost to the Aussie open team 15-1. I've never experienced a team that laid out so prolifically and with such unexpected success. As Masters we didn't give them the credit up front they deserved and they spanked it into us. The next game was Currier Island open. In the past CI has brought some really quality to the pitch in both Spirit and Competitive play and this was no change from that. With no repeat players back they were lucky to form a team at all and suffered from only having what looked like 7-8 players. Respect to CI for a valiant effort but the masters cool (and numbers) prevailed chalking up win number 1 10-7. Lastly the game of games. GB Masters vs GB Open. Women around the event were moistening up at the thought of this colossus of a match. It started with skill from both teams attracting a crowd however the Masters, while moving it seamlessly up pitch could not seem to hit the mark in the endzone. The babes of GB Open capitalized on this temporary lapse using pure speed and youthful exuberance to hit the deep players and create opportunities. In the end although the GB Open team scored more points than the Masters, the real winner was of course GB Masters losing with a respectable score of 4-16. Wayne Davey was to blame for the loss completely because he's not really a 'Dave' while the Open team boasted 4 Daves. We didn't stand a chance. I'm a bit behind on the blog posts so I'll get some of the past few days published soon. In the meantime here's the scoop on the event which starts today in terms of play. With a killer opening ceremony open (video to come tonight of that) complete, old friends reunited and the initial party enjoyed thoroughly it's time to play. All of the GB teams have about 3 games today. I'll summarise those results as an addition to this post tonight. Masters have a hell day playing again Aussie Open, Currier Island (my old team), and GB Open. Yes that's right today GB will clash on the same. The Open team, know also as the Junior team with an average age of something like 20, will be matching fitness and gobbyness against the old wisdom and cool of the Masters. That is the game to watch today. The Mixed have a tough one as well facing at least the US and the Canada Mixed teams. I believe they may also have the Scottish mixed to face as well. 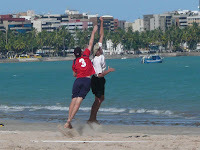 More details is available about the schedule and basic rules of play here http://www.beachultimate.org/blog/. Gotta run...Aussie's to beat. After Natal some of us went on to a historic town called Olinda We didn't do that as we had more of a beach craving so we decided that Pipa was the answer as we'd heard such good things in Natal from the hotel people and from our lonely planet and rough guides to Brasil. Skipping back to Olinda for a moment. If you do even go here, get money in advance as part of it's historicalness seems to include no bank machines. We received a text message from Wayne Davey to this effect and this also partly swayed out decision to hit the beaches of Pipa. I think I'd heard that some of the GB Mixed team hit Olinda as well when speaking with Anna Shipman. The odd person (Caesar) headed straight to Maceio on the overnight bus. 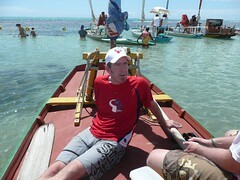 We took 2 taxis for R120$ each from our Natal hotel straight to our new hotel in Pipa (www.rivasdream.com). Note the url. It was just that. A beautiful little dream land on what appears to be a rather nasty little road. If you're looking for it, turn left at the big pile of garbage as you leave the city centre. So we were in Pipa! (http://www.pipa.com.br/conteudo/informativo/english/conheca.html) What to do? We dropped our bags in our rooms (R120$ for a three person room) and walked into town. We did a great interview with Dale you can see here as well. He summarised the experience thus far rather nicely. We roamed about the shops, saw yet another creepy nativity scene being overlooked but what appears to be a nightmarish sailor with a possibly broken neck. 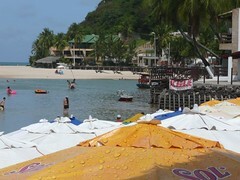 We head down to the main beach which had about 10 feet of actual beachyness rammed with parasols. The food was great and the restaurants plentiful. What was immediately noticeable about Pipa was it's lack of tourists. With that was a lack of random people harassing your to buy more crap. Great success. After dinner the highlight of the afternoon was wading across the water with bags over head ( mr sensible me decided to just walk around on the boardwalk rather than risk dumping £1000+ worth of camera related treasure into the sea. Arrr. You can see in the picture above where the destination was. A small outcropping of beach about the size of 6 ultimate frisbee beach pitches, had a bar and for some reason, nobody was on it. So we had a quick game of friz there, splashed about in the sea and enjoyed some Mojitos at the rustic bar there owned by a guy names Marcus. What's odd about this is, Natalie had read an article in the Guardian about a guy who was an IT consultant in Notting Hill who gave it all up, left everything behind and came to Brasil to open a bar. Living the dream you might say. Well here we were at his bar. I took some video of Marcus I've not had time to edit and unfortunately I did realise I did not get a photo. Arrrgh! A quick interview the surf/ultimate god Dale Madden out front of the Rivas hotel (www.rivasdream.com) in Pipa. Surely if Keanu Reeves can learn to do this in a short montage, I can pick it up in a morning. I even had Surfing guru Dale Madden holding my hand through the process. Once at the beach, as I'd missed the initial hiring I had to wear a women's rash vest top which kept on riding up giving me a sort of a Daisy Duke unnecessarily exposed mid-region look while almost defeating the purpose of the top. 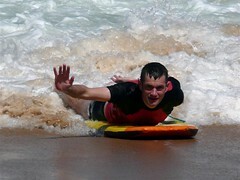 My first go had me catching a wave straight into the beach. I didn't stand up but just got a feel for it. I was ready. I was a natural. Check the video. I think it's pretty clear that you don't really need to pack anything at all before a beach holiday in Brazil. The beach of Ponta Negra in Natal to be specific as my knowledge of this extends only to this region thus far. On the beach yesterday within an hour of securing our comfortable little oasis in the sand under a large parasol with a majestic view of the waves crashing onto the beach, the illusion of relaxation was harshly interrupted by a literal ebay of items for sale ranging from the practical to the bizarre. fruit, sunglasses, towels, beads, massage, hair braiding, surfboards, DVDs, big hats, small hats, coconuts , watches, Natal Tshirts, Brazil Tshirts, underwear, bikini tops, speedos, green coloured corn, beer mugs, flags, fine art, carpets, voodoo-like wooden sticks, booze (hurray! ), bundles of sticks, grilled "meat", small clay dolls, squeezie toys, fine art, horses, woven swing chairs, AND my personal favourite, a 2 foot tall dark wood carving of a dolphin! Where am I going to put it all? Today the beach was the perfect answer to the stress of the pre-Brazil life. I spent a good part of the morning and afternoon just sitting in a chair under an umbrella in the Brazilian sun doing absolutely nothing and it was everything I thought it could be. A few of the other hired some boogie boards and did a little body surfing with some success as the waves were at times a good 6+ feet high. I'll put this in perspective right away. I'm updating this from a hammock on the balcony of my hotel room over looking the sea. Check photo from shiny new Lumix camera purchased at the Gatwick duty free shop. Yesterday was generally painless. The flight was good considering it was a Thomson flight. It reminded me of the last Air Canada flight I took with the wee tiny screens, clearly well used seats and perky staff. I suppose considering that the staff could possible be getting a weeks holiday in brazil could explain the perkyness. Our Thomson flight only flies on a Thursday. That means that either the staff are subjected to back to back 10 hours flights...or...they change staff and drop one for a week, load up last weeks and go home. I suppose the flight back with tell all by the magnitude of the tan lines on the returning flight crew. Getting to the hotel was interesting as only two of the 10 or so people had booked the transport to the hotel (http://www.otempoeovento.com.br/ingles/index.htm). The driver who came for the people that booked phoned taxis for us. It was pretty good service considering the taxi was actually less (R34$) than the booked price of R35$. We checked in, got our free welcome caprinha drink, and sat in the pool for a bit. After a few drinks we went 15 minutes down the beach and ate Mexican food which for me was jambalaya. I know this isn't Mexican but it was the only word in the bilingual menu I could understand. The menu was in two languages I don't know. I assume one was Portuguese and the other...Spanish? Suffice to say the food was excellent and the price even better. Restaurants beers are around 90p each. I haven't been to a market yet to see what they could possibly cost there. I ended the night chatting to the Mixed team about stuff in general and the plans for the next few days. I think it's still up in the air for most people. We're all here for another day and a half at least and then the consensus seems to be to hit an area of Recife. Once that's agreed I'll detail the route. Off to find food now to remove the mild hangover. We've got a plan to have a practice today around 4pm. Should be interesting. At the hotel O Tempe E O Vento now. The balconies have hammocks. Very nice. We just had a few drink by the pool and are going out for some vittles. The flight was much better than expected. Although the entertainment was a bit forced with small screens servicing a large population, the films were mindless and entertaining with Transformers, Oceans 13 and Night at the Museum. Perfect brain fodder to get your mind into suspending disbelief mode. Ok...little time as the cameras are charging and the team is waiting. A new blog to be part of the blockstack.tv website once launched. Until then...it's a source of ultimate highs and lows.